There are very few places here in Vermont that I have never been but Ticklenaked Pond was one of them up until recently. And the circumstances that led me there were as “circuitous” as the roads I travelled. You see, we needed to talk with Ray Hartson, a retired man who has helped us can maple syrup for years. 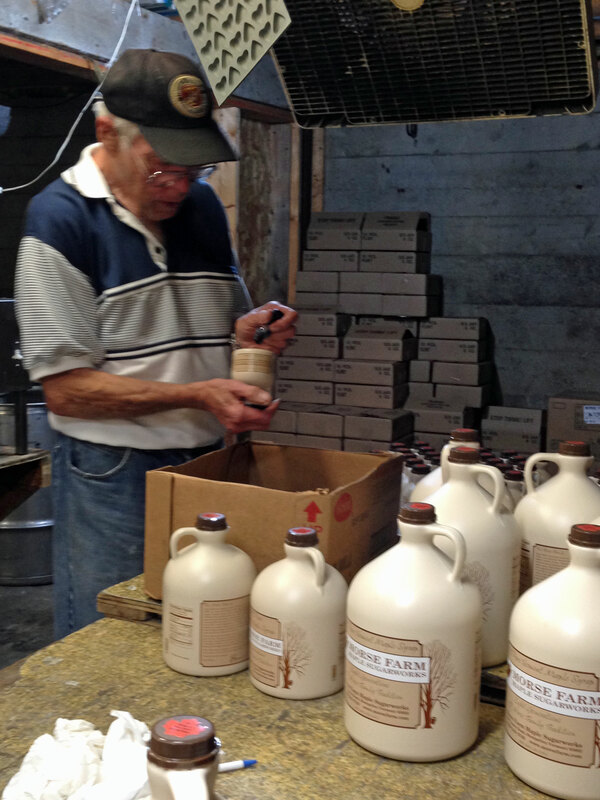 We only need Ray’s help seasonally here at Morse Farm but with tourist season starting up, those empty jugs beckoned. Ray and his wife Shirley had departed for Ticklenaked back in May to live in their travel trailer. “There’s no cell service there” he said when he left, assuring us that he was ready and raring to can, “but we go over to the P&H Truck Stop, where there is, every mornin’ for breakfast”. And to that I say “sure Ray”! I spent a few days attempting to call and even put out a plea on our local WDEV radio…”Ray Hartson, if you’re out there please call Burr Morse”. Finally, accepting that modern-day phone technology was as useless as teats on a bull, I resorted to modern-day Pony Express…I hopped in th’old Toyota and drove to Ticklenaked. First,MapQuest, an integral part of modern-day Pony Express, put me on US Route 302 and a pleasant hour of eastward ho. Just before the New Hampshire border, I turned left on Boltonville Road which led me to one of the most picturesque country settings I’d ever seen…a hillside farm, farmers out in a field haying, and Ticklenaked Pond down in a valley beyond the fields. I even saw from the main road, a small community of travel trailers on the far side of the pond. Another left turn brought me to the trailers. I stopped at the one where Ray’s grey Ford pickup was and there sat Ray enjoying a mid-afternoon beer out on his deck. Obviously “tickled” that I would seek him out the way I did, he offered me a beer, which I accepted, and we sat in the shade and had a great chat. Before I left, I asked Ray and Shirley if they could tell me the origin of the name “Ticklenaked”. I would find that their answer was common throughout the whole Ticklenaked community including Ray’s landlord and even the farmers out in the hayfield…”Gosh, really don’t know”, they all said. When I got back home that day, I reached out by email to Marsha Nelson, the town clerk of Ryegate, the town where Ticklenaked is located. She kindly faxed me an article published in the Bradford, Vermont Journal Opinion on May 24, 1995 by Lucy Heath. Although Lucy Heath’s article sheds no provable light on the subject, I came away satisfied of the name’s origin. Ms. Heath wrote: “one theory is that the name comes from the Algonquin Indian name “Tickenecket” which means “the place of little beavers”. Being a Yankee, this made perfect sense to me. You see, Yankees are famous for “tongue-in-cheek” alterations of legitimate geographical names, examples such as: “Mountpeculiar” for “Montpelier”, “Taxachusetts” for “Massachusetts”, “Maniac” for “Mainer”. Although a bit disappointed that Ticklenaked wasn’t the result of an amorous affair between some early Ryegate inhabitants, I was finally satisfied that my question had been answered. As I write, Ray has already been here and filled some of our jugs with syrup and, no doubt, will spend many more days here doing the same. As for my hard luck with the modern-day phones, I say “pshaw” to that…I got a very pleasant road trip and a chance to sit with a friend for some good cheer. Better yet, though, this Yankee “Mountpeculiarite” once again found that there’s always a way to get through…if those cussed phones let me down again, I’ll be glad to drive back to one of the most picturesque Vermont settings of all, Ticklenaked Pond! p.s. Ray just dropped me a note saying he would appreciate you folks keeping him busy. So check us out at wwww.morsefarm.com.